The last few days I have been in Halesowen in Birmingham for a 2 day balloon event, it was brilliant and I learnt so much new stuff, it was not just new sculptures for me to make but also for some new twisting techniques. the highlight for me was the David Grist Memorial Lecture by Antonio Becarus from Spain. One of the things Antonio taught us was the pinch line technique and I have used it in this sculpture of a lobster. I am not going to tell you what part of the sculpture is made using the pinch line technique but if your familiar with balloon modelling then you can probably work out which bit it is. Antonio was an excellent teacher and I thank you for sharing your knowledge. My Lobster is made from 3 x 260s plus 2 bits of scrap balloon. 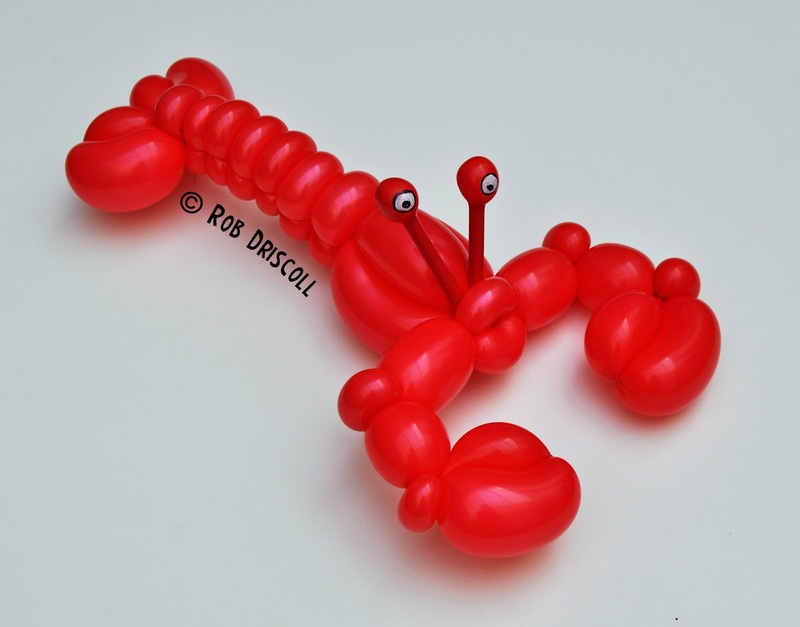 I used 2 balloons for the tail and then 1 for the body and pincers, the bits of scrap balloon were used for the eyes.